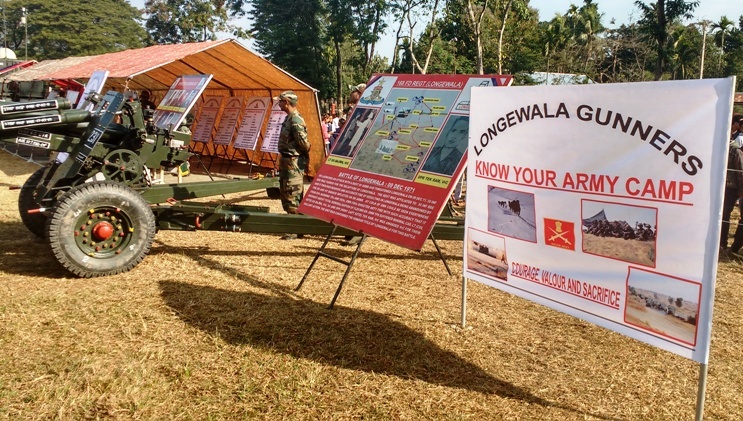 To fortify the confidence of people in the good intent of the Indian Army and motivate the North East youth to join the defence services, a “Know Your Army Camp” was organized by the Army Camp, Golandi under the aegis of the Red Horn Division on 26th January in the parade ground, DC office at Udalguri. The exhibition gave insight into the “ethos, culture and war fighting potential” of Indian Army and inspired the youth to consider Army as their career. A number of sophisticated weapons and war fighting equipment including Artillery Guns, small arms and the latest thermal imaging and night observation equipment were displayed for the general population, especially the youth at the exhibition. The aim of the event was to inculcate the spirit of patriotism in local youth and motivate them to come forward in nation building. Students of various schools and local public showed keen interest in the camp organized. “ It is important to note that the youth of the region have been showing a growing sense of interest towards joining the Armed Forces, requirement is to only show them the way and provision of guidance”.